The hotly anticipated celebrity chef dinner series has returned to London’s finest train. This year’s line-up is the perfect pairing to Belmond British Pullman’s iconic old-world pizzazz. For glamorous gastronomes, the celebrated ‘pop-up’ dining events aboard Belmond British Pullman are not to be missed. This year a host of culinary characters are taking part, from Raymond Blanc OBE to Michel Roux Jr and James Martin. Chef whites have been starched and recipes reimagined ready for this series of unique soirees. 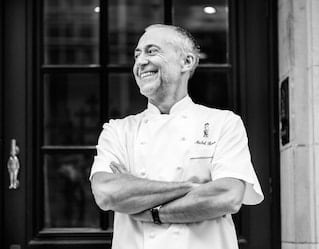 Join us as Michel Roux Jr takes over the train. As one of Britain’s few two Michelin-starred chefs, his presence on board is set to cause quite a stir. 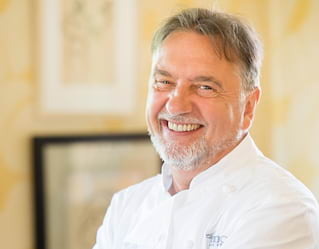 On 28 September 2018, Michel will embrace his training and vast experience in classical French cookery to serve up a menu of specially crafted courses. 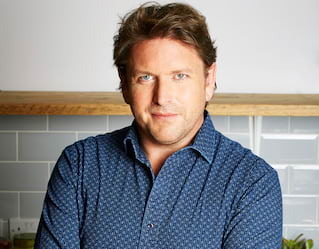 Returning to the series for his fifth season is Food Hero favourite James Martin. Anticipate a heartwarming menu inspired by his Yorkshire roots. Comforting and hearty dishes will reflect James’ love for nostalgic recipes, with each course influenced by his travels in France. His most recent publication, James Martin’s American Adventure, regales his “culinary journey of a lifetime”, an experience you can share with him on 16 November 2018. Gourmet pioneers should head to Southeast Asia in search of something a little more exotic. Board the Eastern & Oriental Express in Singapore for a three-night culinary escape hosted by Ian Kittichai. Dine on acclaimed chef Ian’s signature cuisine and embark on a gastronomic adventure from 18-20 November 2018.